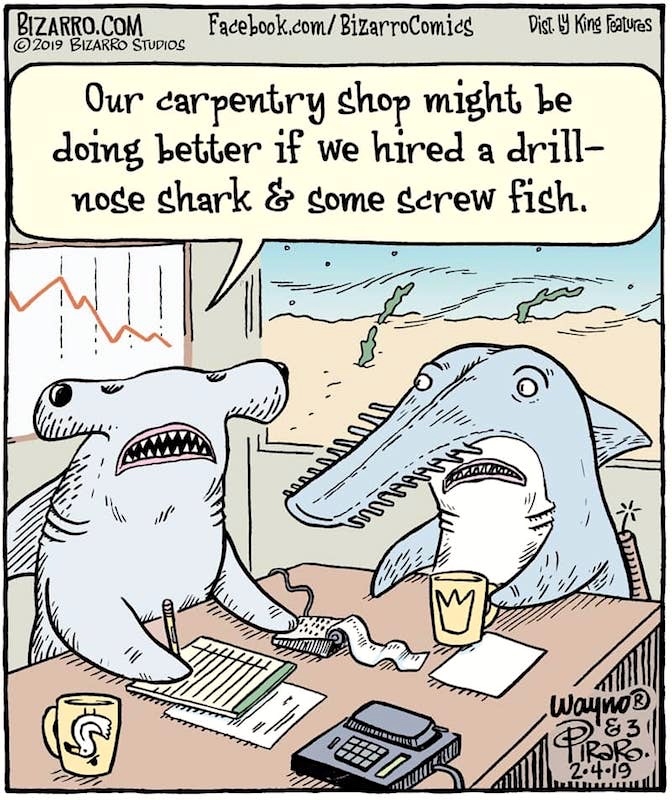 To understand the cartoon, you need to appreciate that it shows a situation from everyday life (the office of a carpentry business) juxtaposed with, or translated into, another, more remarkable, world (an undersea, aquatic, world, populated by specific fish, which you need to recognize). On the cartoon translation of one world into another, see my 8/4/18 posting “Cultural knowledge”, with examples from three cartoons. In #1, appreciating that it’s set in the office of a carpentry business is easy, because one of the characters says that right out. But then you must recognize the species of the two fish characters, in their common names: hammerhead shark and sawfish. Thus supplying a hammer and a saw for the carpentry business, which proposes to seek out more hardware fish, specifically for a drill and some screws. The hammerhead sharks are a group of sharks in the family Sphyrnidae, so named for the unusual and distinctive structure of their heads, which are flattened and laterally extended into a “hammer” shape called a cephalofoil. Most hammerhead species are placed in the genus Sphyrna, while the winghead shark is placed in its own genus, Eusphyra. Many, but not necessarily mutually exclusive, functions have been proposed for the cephalofoil, including sensory reception, manoeuvering, and prey manipulation. Hammerheads are found worldwide in warmer waters along coastlines and continental shelves. 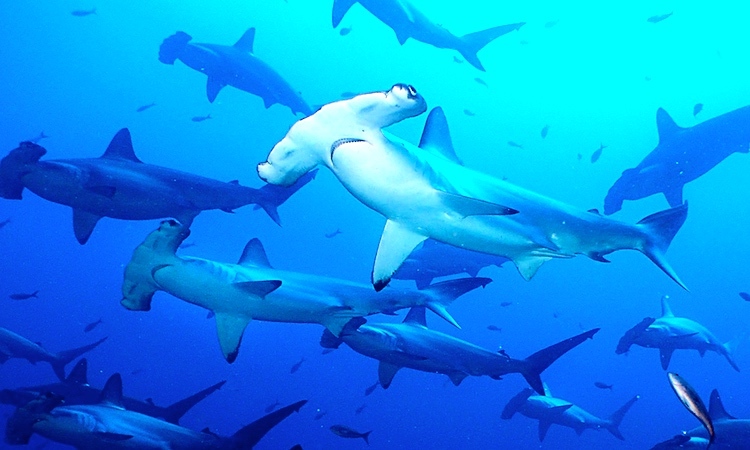 Unlike most sharks, hammerheads usually swim in schools during the day, becoming solitary hunters at night. Some of these schools can be found near Malpelo Island in Colombia, the Galapagos Islands in Ecuador, Cocos Island off Costa Rica, and near Molokai in Hawaii. Large schools are also seen in the waters off southern and eastern Africa. 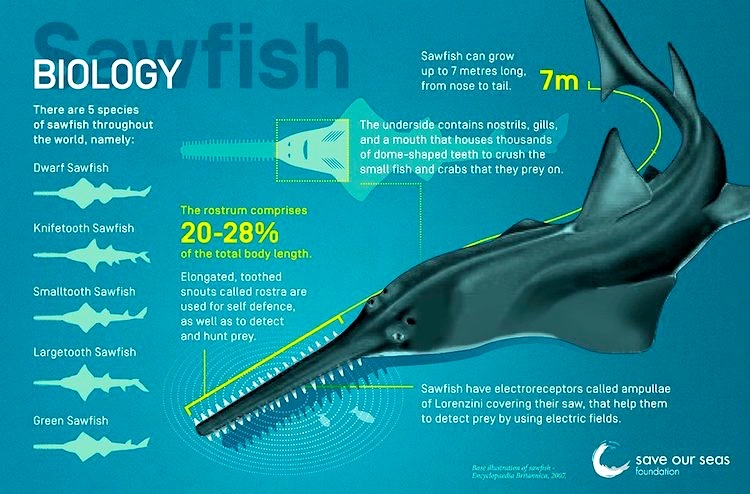 Sawfishes, also known as carpenter sharks, are a family of rays characterized by a long, narrow, flattened rostrum, or nose extension, lined with sharp transverse teeth, arranged in a way that resembles a saw. They are among the largest fish with some species reaching lengths of about 7–7.6 m (23–25 ft). They are found worldwide in tropical and subtropical regions in coastal marine and brackish estuarine waters, as well as freshwater rivers and lakes. Family Pristidae: two genera, in particular Pristis, and several species, including the smalltooth sawfish, aka common sawfish (P. pectinata) and the largetooth sawfish, aka common sawfish, wide sawfish, freshwater sawfish, river sawfish, Leichhardt’s sawfish, northern sawfish (Pristis pristis). The articulation of the two worlds. The cartoon image shows elements from the two worlds mixed, so that whichever viewpoint you take (that of a carpentry business or that of an aquatic scene), there are discordancies. From the viewpoint of a carpentry business, the piscinity of the two characters is grossly discordant, as is the fact that the world outside the window is an undersea world. From the viewpoint of an aquatic scene, the fact that the two fish are in a waterless, air-filled office is grossly discordant, as is the fact that they can talk and understand language and that at least the shark can write with a pencil. If you think of the carpentry business as a factual world and the aquatic scene as a counterfactual world, it then becomes an issue how far the counterfactual world can diverge from the factual one. In the semantic analysis of counterfactual sentences, it’s sometimes proposed that the conterfactual world should be the closest possible world to the real one, but it’s often not clear what you can change without inevitably dragging other changes along. If we were fish, we could use our fins to swim — but could we still use them as the analogue of hands, to write, or is that inconsistent with transfishmation? Clearly, Wayno and Dan think we can have our fins and write with them too, but what else is still available to us despite our new fishy natures? Could we, say, wear gloves or count to 5 on our fins? This entry was posted on February 5, 2019 at 9:39 pm and is filed under Comic conventions, Counterfactuals, Language and animals, Linguistics in the comics, Names, Semantics, Taxonomic vs. common, Understanding comics. You can follow any responses to this entry through the RSS 2.0 feed. You can leave a response, or trackback from your own site.